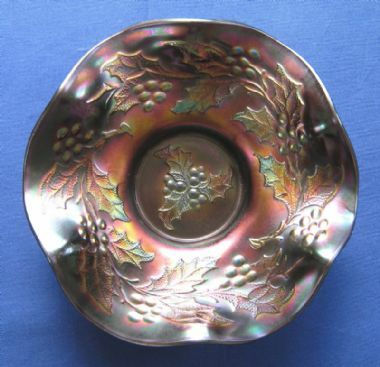 A delightfully Christmassy antique / vintage (c.1910-31) carnival glass bowl by the Dugan Glass Company (later the Diamond Glass Company), in the "Holly and Berry" pattern (a.k.a. "Dugan's Holly") with ruffled edges, in deep amethyst with a good degree of iridescence. This original early 20th century piece shows some signs of age (see condition description below), together with some manufacturing imperfections including lines / straw marks in the glass and a few small protruding lumps of glass to the exterior adjoining one of the twin moulding seam lines. However, it remains a very displayable piece, which would make a great festive adornment for a Christmas tea table!